A flood of potentially stolen art objects from the Middle East is showing up on Amazon, eBay, Facebook and WhatsApp, often ensnaring unsuspecting buyers. Earlier this year, Stephennie Mulder was in her office at the University of Texas at Austin when she received a Facebook message from Yemen with pictures of gold coins and an ancient tomb. “I found the treasure in my towns,” read the message from Ahmed Bakil Al Marhabi, who was a stranger to Ms. Mulder.Ms. Mulder, an art history professor, suspected immediately that Mr. Al Marhabi was offering her looted antiquities, part of the growing flood now being peddled on social networks, messaging apps and online marketplaces like eBay and Amazon.“Sending me pictures of a tomb…is pretty gutsy,” said Ms. Mulder, who believes she was targeted because of her participation in antiquities groups on Facebook. 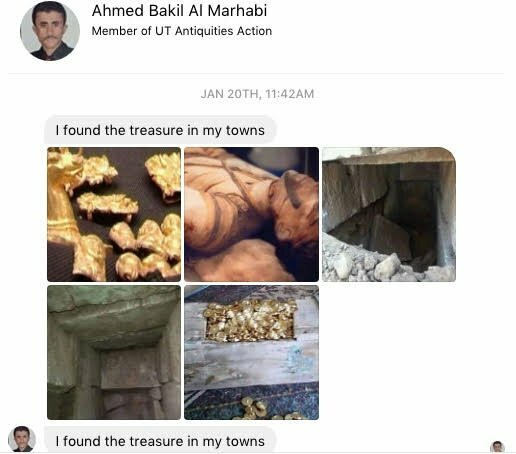 Stephennie Mulder, a professor at the University of Texas, received a Facebook message from Yemen with pictures of gold coins and an ancient tomb.‘I found the treasure in my towns,’ read the message from Ahmed Bakil Al Marhabi, who was a stranger to Ms. Mulder. Criminals have for years sold illegal goods online. But the growth of social networks and e-commerce platforms, coupled with the recent industrial-scale looting by Islamic State across the Middle East, has brought a stream of stolen antiquities online, often being offered to unsuspecting buyers, according to U.S. and European security officials, antiquities experts and documents seen by The Wall Street Journal. Law-enforcement officials say the online outlets have become a vexing challenge as they battle a wave of looting that is stripping heritage sites of ancient artifacts. Revenue from the sales is often used to finance various types of terrorist and criminal groups that also use the trade to launder other illicit income including drug and weapons trafficking, U.S. and European government officials say. “ISIL has been exploiting the potential of social media more and more frequently so as to cut out the middleman and sell artifacts directly to buyers,” the European Commission said in a July report, using an acronym for Islamic State. Facebook, Amazon, eBay and WhatsApp all say they have explicit policies prohibiting the posting of stolen objects and mostly rely on reports of stolen material. Facebook says when content is reported as stolen, the company removes it from the site. Amazon says those who don’t follow its guidelines are subject to action, including removing their account. 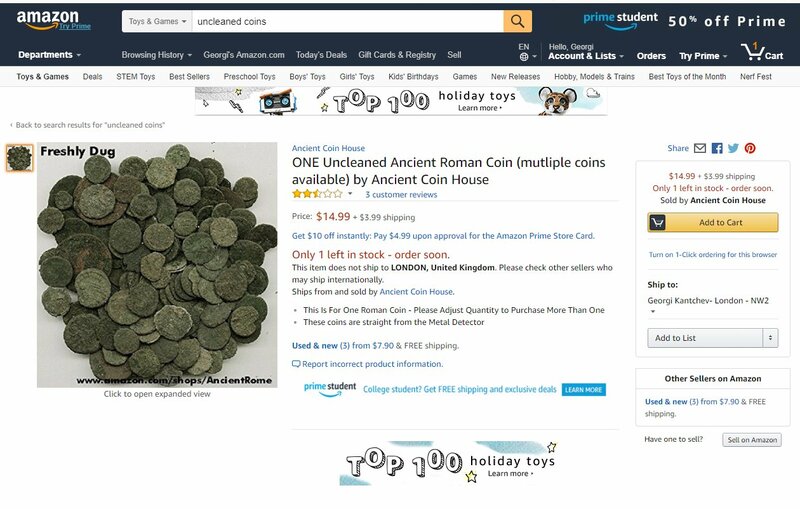 Amazon removed an ad for an ancient Roman coin and two others after the Journal contacted the company about the origin of the objects earlier in October. In recent years, eBay has agreed to provide the customs service in countries where it operates with contacts of sellers of suspicious items, according to an antiterrorism official familiar with eBay’s practices. The company took the action after Western counterterrorism officials expressed concern that looted antiquities might be ending up on the site. “We have zero tolerance for illicit items like looted antiquities,” said Wolfgang Weber, global head of regulatory policy at eBay. Scrutiny by the European Commission and U.S. officials over the online antiquities trade is likely to add to pressure on social media, e-commerce and messaging apps. They are already being scrutinized by European and U.S. lawmakers for divisive political messages and extremist content. That has led the companies to look at ways to better police their content. In a Facebook exchange with the Journal, the man who identified himself as Mr. Al Marhabi in the exchange with Ms. Mulder, said he found the trove last year near a farm in Yemen. Mr. Al Marhabi, who said he was a law student, declined to comment on the legality of his offer. The Facebook spokesman declined to comment on specific postings. The Foreign ministry in Yemen didn’t respond to a request for comment. Experts warn the prevalence of looted offerings today—and the limited online policing—means amateur collectors could easily end up buying looted artifacts online. Tim Haines, 53, an amateur antique collector in Worcestershire, England, says he received a Facebook message from a stranger who identified himself as Salah Abdo in Egypt in August. Mr. Abdo was offering a large, 55-pound stone pharaoh’s head for £22,000 ($29,000) and various ushabti, a type of Egyptian funerary figurine. Mr. Haines, a staff member for a British politician, began messaging with Mr. Abdo. The head “belongs in the Egyptian Museum if it is genuine,” Mr. Haines wrote, according to a copy of the message. “No. I don’t work with this. This is from our land,” Mr. Abdo wrote back. The head is from the “back of Karnak Temple. If you interested we give good price.” In Egypt, all artifacts uncovered after 1983 are the property of the government. Most countries have similar laws. Mr. Abdo didn’t respond to requests for comment. The Egyptian Supreme Council of Antiquities didn’t respond to a request for comment. Mr. Haines didn’t buy the objects because, he says, they were expensive and he suspected they were stolen. He says that amateur collectors have to be extremely attentive to provenance these days. “There’s a lot of illicit material out there now,” he said. He didn’t report the case to Facebook. There have been no publicly documented cases of antiquities looted by Islamic State landing in the U.S., but security officials and art experts suggest a flood of artifacts they believe are from conflict zones being marketed online. Artifacts looted in Syria and Iraq are already moving underground and may not surface for decades, law-enforcement officials say. Between 2010 and 2015, a study by Ute Wartenberg Kagan, executive director of the American Numismatic Society, found a “significant surge” on the global market in the number of coins minted in the reigns of Zenobia, a third-century queen of the Syria-based Palmyrene Empire, and her son. That surge coincides with the start of the Syrian war in 2011 and the rise of various terror groups that have been active in the country. That is “something that most coin collectors and many dealers in the U.S. are largely unaware of,” Ms. Wartenberg Kagan says in the study. Law-enforcement officials also say they are seeing an increased offering of looted antiquities on the dark web, a network of websites that is accessible only by means of special software and used by hackers and others to anonymously share information. But the trade of potentially looted antiquities is flourishing across a range of popular online platforms, social networks and messaging apps. Syrian antiquities expert Muhamed Hajj al-Hassan says he often receives pictures of looted objects put up for sale by officials he believes are from ISIS on the encrypted messaging system WhatsApp. A Syrian national, Mr. al-Hassan says he started to trade antiquities in 2015 after being contacted by a top official of Islamic State who sought his archaeological expertise to find Western buyers. He has since denounced the group and declines to say if he is actively trading. This summer, a Syrian trader posted a silver pendant dating from the second millennium B.C. and antique Jewish coins dating from the first century A.D. in a WhatsApp group for antiquities traders that Mr. al-Hassan belongs to. The trader said he was ready to smuggle the goods into Turkey if he found serious buyers, Mr. al-Hassan said. A spokeswoman for WhatsApp didn’t comment on specific messages but pointed to the company’s terms of service, which prohibit its use for content infringing property rights and other illegal activity. While e-commerce sites have been an important sales channel for the antiquities market for years, the looting trade has increased recently, security experts say, often in full sight. A recent advertisement on Amazon offering “One Uncleaned Ancient Roman Coin” for $14.99 depicted dozens of coins covered by such dirt. On Amazon, third-party sellers have advertised “uncleaned coins,” a tell-tale sign that they might have been recently excavated. Experts refer to such coins as having “desert patina,” a mineral deposit similar to rust that often adheres to metal objects as they decay. On Amazon, sellers have advertised ‘uncleaned coins,’ a tell-tale sign that they were recently excavated. “Freshly dug,” the ad read. “These coins are straight from the Metal Detector.”“This stuff is certainly illegally looted and smuggled,” said Nathan T. Elkins, associate professor of art history at Baylor University in Texas, referring to these coins and other similar ads he saw on Amazon.Amazon said it removed the Roman coin ad and two others after the Journal contacted the company. Mr. Weber of eBay said he has “learned so much about antiquities in recent years” in his work with law enforcement and archaeologists for more than a decade. When eBay receives a report from law enforcement or another source about a potentially illicit object, it starts its own investigation, Mr. Weber said. That typically involves contacting the seller, asking for the object’s provenance and working with law enforcement and experts to verify it. Depending on the outcome of the investigation, eBay could remove the listing, Mr. Weber said. Law enforcement has also had to adapt. —Benoit Faucon and Valentina Pop contributed to this article. 2017-11-03 in Fakes & Forgeries, General, Illegal excavations, Selling of unprovenanced items.